The rise of the wonderful and incomparable Daniel Bruhl has been well-witnessed, at least among those who have been paying attention. The German/Spanish actor has been hitting more home runs than not with his film choices, or perhaps his talent level helps lift each lucky movie he appears in. Inglourious Basterds, Rush, A Most Wanted Man, Woman in Gold, The Colony, Civil War; he has range, enigma, he captivates, fascinates, and we’re seeing him smack dab in the middle of his prime. What’s incredible about his role in Alone in Berlin is that it’s not even the lead, but he shines anyway. And what’s incredible about the film itself is that it boasts such a young star but also sticks him in a package with two fantastic, proven veterans, making other features jealous of its wealth of plot and particulars. In Berlin in 1940, the War seems a simple, winnable thing, a destiny that all Germans share. They celebrate the fall of France as Europe will some years later celebrate its own liberation, predicting an end to the conflict in a few weeks or months, when England assuredly falls. Still, battles must be fought and men must die, including Hans, the only son of aging, working-class couple Otto & Anna Quangel. They have always been hesitant to officially join the Nazi party, to support Hitler entirely, due largely to the fact that they are simple people without a heretic’s ideals. When their son is killed, any reason for supporting the cause vanishes, and it is replaced by an angry spark that fans to flame. Otto, hiding his handwriting, wearing gloves, and choosing random locations, begins dropping anti-Hitlerism propaganda throughout the city, small cards that call for the voice of the people to lift up, join together, and to defy a nation that is building itself on hate. Anna joins in the charade, quickly becoming an accomplice to a crime that may seem harmless to some, but catches the eye and the ire of the SS. Local investigators nickname the criminal the Hobgoblin, scrambling to find him before the upper echelon’s embarrassment turns to violence, before they are punished by a regime that lacks patience for those they deem unable to fulfill the duties they owe to their fatherland. Bruhl plays the cop, Gleeson and Thompson the mother and father, all three combining to create a terrific trio that could carry a film were they given nothing but a few rags to wear and a few lines to spout. Bruhl fits into this era so well, his accent and his demeanor matching the genre perfectly, down to the funny mustache that works so well. Gleeson may have had the weakest German drawl, but it can’t be easy for an Irishman to pull that off, and his character was so excellent that any small flaws were quickly forgiven. 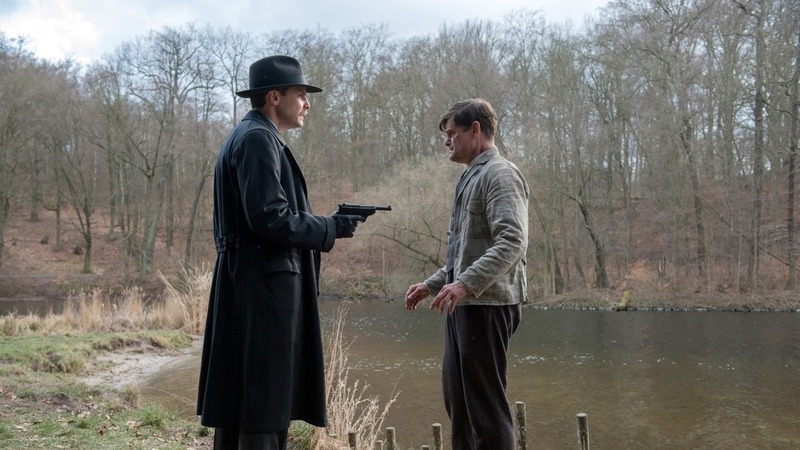 And Thompson was the glue that held the entire story together, offering Gleeson support when he needed it and creating another emotional layer to the film when one would have been good enough to get by. The surprise was in the direction, since Perez does not have much experience, and this subject matter could easily weigh down whatever a filmmaker was trying to lift up. There were scene choices throughout that caught my eye, an attention to detail and cinematography that was pleasantly unexpected. The film flowed nicely without needing much action to drive it, the characters themselves picking up all the slack and pulling the plot along. 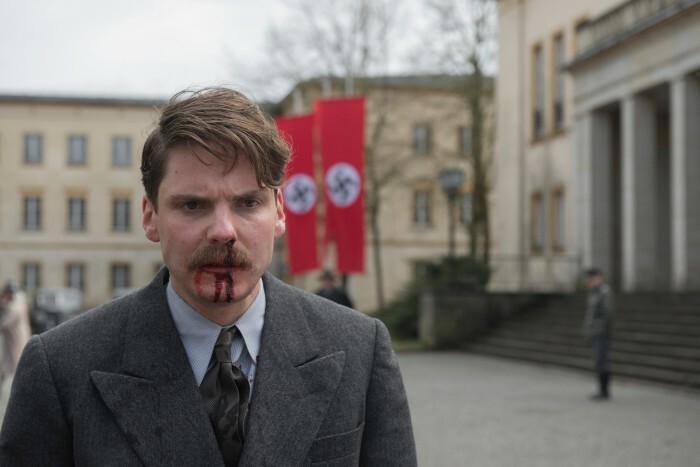 This time period is pretty awesome, from whichever perspective you want to view it, and we don’t often get to see what was happening deep within Germany at the time, so that was a nice change from the standard WWII war flick. 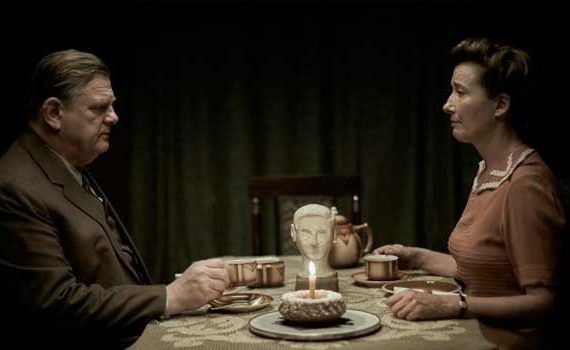 Alone in Berlin is laudably strong from start to finish, flying under-the-radar but deserving much more. Video – With an aspect ratio of 2.40:1 and filmed using a Sony CineAlta F65 camera, the video quality of the film is just above run-of-the-mill, solid but not amazing. It captures the feel of the era just fine, without reaching Hollywood elite heights. The cinematography is better than the actual picture, which is fine by me. Audio – The DVD was done in English 5.1, with an option of English SDH or Spanish subtitles. The sound quality of the film is fine, without anything memorable, but it does offer a strong backing soundtrack to help drive the plot. Extras – There are two bonus features on the disc: interviews with cast/crew and a trailer for the film. Highly Recommended. 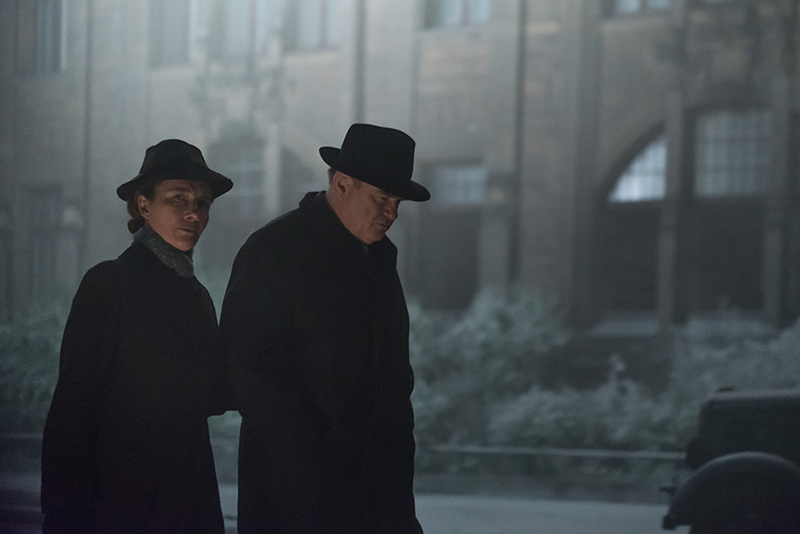 If you are in the mood for some master-class acting set against an uncommon backdrop, Alone in Berlin is the flick for you. Bruhl, Gleeson, and Thompson all deliver stellar performances, while fitting into the era with ease. This is a story that needs to be told, an uncomplicated tale of ordinary people who did what they could in extraordinary times. This isn’t a movie to take home a barrel full of awards, nor will it go down as one of the best WWII tales of all-time, but it can be appreciated for its simplicity and its grace, especially among such horror. The video, audio, and extras are all only OK, so look elsewhere for technical marvels, but you won’t find them distracting either. The film speaks clearly, views cleanly, and is easy to recommend.